saxon microscopes offer precision and reliability here in Australia. Thanks to its advanced design and features, you have your pick from our range of compound, stereo and digital microscopes. Available to support home, education as well as industry use, scientists of all ages will appreciate the exceptional microscopy experience from a saxon microscope. We have a showroom here in Melbourne, Australia and you are more than welcome to drop by to browse through the range of microscopes we have here. Our ScienceSmart microscopes are built for young minds to explore the world of microscopy. With straightforward settings that require minimal adjustments, beginners and amatuers will appreciate how easy it is to use this microscope. Solid and user- friendly, ScienceSmart microscopes are a good addition for home and family use. The Prodigy series is a step up from our ScienceSmart series. Equipped with additional features such as quadruple nosepiece and locater markings, the Prodigy is a favourite amongst researchers and students. The easy to use microscopes are also great for beginners who need the same experience without all the bells and whistles. The Researcher series are built for advanced microscopy work that allows users to scrutinise samples at every angle with ease. These microscopes come with a trinocular head that provides not only comfort when observing through two eyepieces, but also the opportunity to take pictures and videos of the sample. 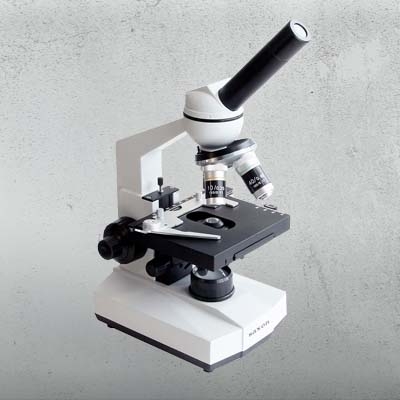 The Researcher microscopes are perfect for anyone who needs serious microscopy work done. If you are looking for a Biological Microscope here in Australia, then look no further as we have a wide range of biological microscope here at saxon. Ranging from entry level to laboratory use, our biological microscopes come with features and capabilities that will suit your needs. Should you need a biological microscope for a specific use but not sure where to begin, please contact us and we will be happy to guide you through. Stereo microscopes or dissecting microscopes are best used when observing 3D objects or objects that are not mounted on a slide. Our range includes stereo microscopes for high school students, teachers, lab assistant and even farmers. Some microscopes come with a trinocular head which also allows you to take a photo or video of your sample. If you need any assistance choosing a stereo or dissecting microscope, please talk to our friendly staff and we will guide you through to find a suitable one. Digital microscopes are a great way to take pictures and videos of your specimen. Some biological microscopes come with attached LCD screen so you can do some digital imaging and observe the specimen at the same time; while some other microscopes come with a separate digital camera where you'll need to attach it to the microscope an computer. Gemological microscopes are often used to look at the cut and colour of gems, stones and jewels. 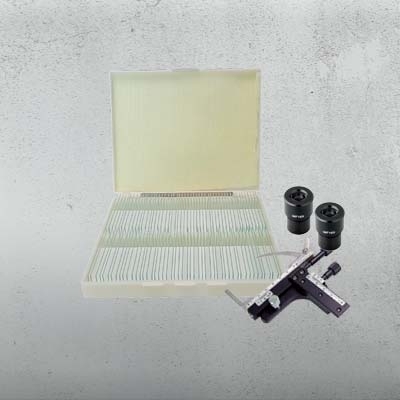 Gem Microscopes usually comes with a darkfield condenser and a set of jewel clamp with illumination coming from the top and bottom of a microscope. This often will help determine the outlook of the stone's surface and interior's condition. The perfect stereo microscope for the aspiring scientist and hobbyist alike. Encourage young scientists to explore the world around them with the saxon SBM ScienceSmart Biological Microscope. This microscope features a built-in light and has three powerful magnification settings, making it a great addition to any home laboratory. Powered by a choice of batteries or AC power, this portable microscope is suitable to use both indoors and outdoors. The saxon TKM ScienceSmart Biological Digital Microscope Kit is the picture perfect gift for scientists of all ages this Christmas! This biological microscope comes with 3 objectives of 4x, 10x and 40x, a Wide Field 10x eyepiece as well as a USB digital eyepiece. Easy to use and a great way to start exploring the micro-organism world around us. Observe three dimensional objects around you with the saxon PSB X2 ScienceSmart Stero Microscope. Adjustable eyepieces allow you to create a more comfortable fit so you can focus on the object you’re studying. This stereo microscope is ideal to use at home or in the classroom. 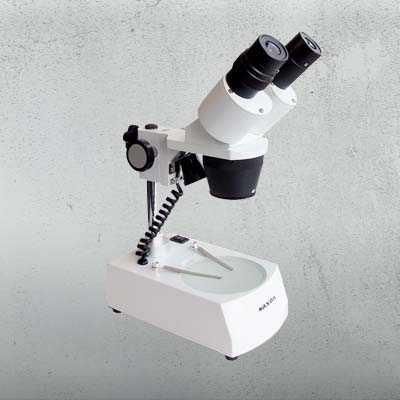 An ideal student and teachers microscope, the saxon ScienceSmart Biological Microscope 40x-640x (SBM) makes observing specimen easy and straightforward. The magnification of 40x, 100x, 400x can be easily swtiched by rotating the nosepiece. To increase power, simply change the eyepiece to a WF16 and you will have additional magnification of 64x, 160x, 640x, . Once the nosepiece is clicked into place, the dual coarse and fine focus allows for further adjustment until a clear vision comes to place. Specimens are illuminated with LED and the light intensity is easily adjustable with the dial on the base. The saxon PSB X1-3 Deluxe Stereo Microscope is a great combination of affordability and reliability. Featuring magnifications of 10x and 30x, you'll be able to view refined 3D images of your object thanks to the quality optics in this microscope. 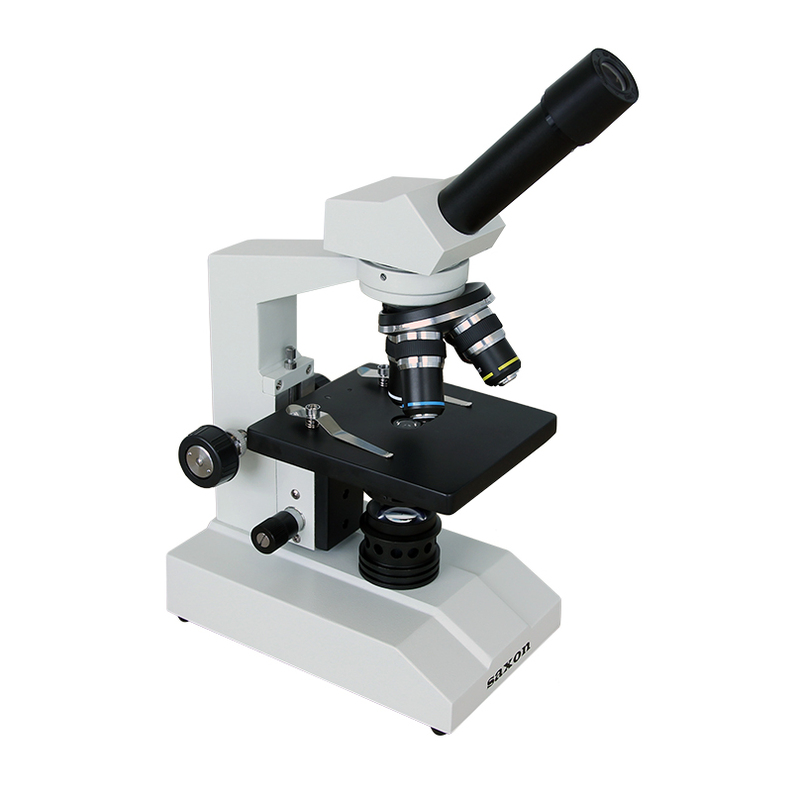 This dependable microscope is suitable to be used both indoors and outdoors. The saxon PSB X2-4 Deluxe Stereo Microscope is a good entry-level stereo microscope that's ideal for researchers of all ages. This microscope comes with two magnifications of 20x and 40x, a 45-degree inclined binocular head and two illumination points to bring out the finer details of your object. 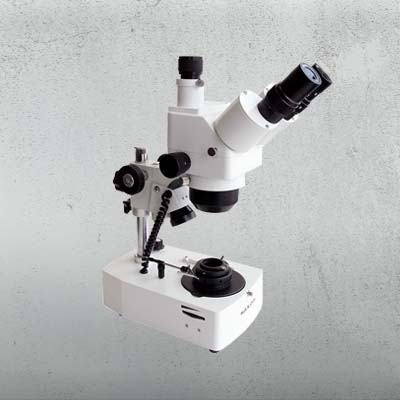 Housed in a rugged metal case, you can be sure of the durability and quality of this microscope. If you're looking for a moderate microscope with the bells and whisltes, look no further than the saxon Prodigy MK II Biological Microscope 40x-1600x. Featuring a quadruple nosepiece with magnification up to 1600X, specimens can be observed at their finest with just a turn of the objective lens. The addition of coaxial coarse and fine focus dial means getting down to the sharpest details of the specimen. This sturdy microscope is also equipped with a mechanical stage that has locator markings so it not only holds a slide in place, but also allows you to mark your specimen. The light intensity dial also gives you the option to adjust the brightness from the transmitted LED. So whether it is for research or homework, the saxon Prodigy MK II Biological Microscope 40x-1600x is a good microscope to work with. The saxon ScienceSmart LCD Digital Microscope is user-friendly, portable and requires minimal assembly. This microscope is best suited for viewing biological specimens and can also be used to observe thin objects such as stamps and coins on the lowest magnification setting. Perfect for both casual and serious use in the classroom, home or workplace. If you are into the study of gems and stones, the saxon GSM Gemological Microscope 20x-40x is a great microscope to start off with. With two sufficient magnification, you can rotate the objective lens between 20x and 40x depending on your preference. The microscope is also equipped with reflected and transmitted lighting, you can have either lights turned on for inspecting surface details and structures. Use the gem tweezer to help hold your stone in place while you focus until image is clear. If you want to observe the stone at a different angle, simply rotate the tweezer until the angle comes in view. Easy to use and powered by either AC or batteries, this is an ideal microscope for hobbyist and gemologist. If you spend a great deal of time on biological research for academic or lab analysis, the saxon researcher compact biological microscope ﻿is the one to go for. Featuring a trinocular head with digital imaging capability, you can take photos or videos of specimens with the additional digital eyepiece that is connected to the computer. The magnification rotates between 40x, 64x, 100x, 160x, 400x, 640x, 1000x and 1600x giving you a wide range of observation. The coaxial coarse and fine focus aids in sharpening the smallest details which can take your observation to the next level. Not forgetting the mechanical stage that boast an x-y linear to slide the specimen in place, and locater markings for tracing specimens. Powered by AC or batteries, the saxon researcher compact biological microscope ﻿can used indoors or outdoors. The saxon RST Researcher Stereo Microscope is a solid stereo microscope designed for serious use with a digital imaging feature. This trinocular-head microscope features individually-focused eyepieces with a magnification range of 10x to 40x. You'll also benefit from a variable upper and base illumination to help highlight different views of your object. This sturdy, well-built microscope combines quality optics, durability and ease-of-use, making it a must-have for any serious scientist. The saxon GSM Gemological Microscope 10x-40x is the next level microscope when it comes to studying or evaluating gems and stones. The zoom lens feature allows you to zoom in and out from the object effortlessly with just a twist of a knob. The microscope is also equipped with reflected and transmitted lighting, you can have either or both lights turned on for inspecting surface details and structures. Use the gem tweezer to help hold your stone in place while you focus until image is clear. If you want to observe the stone at a different angle, simply rotate the tweezer until the angle comes in view. Easy to use and powered by the supplied AC adapter, this is an ideal microscope for hobbyist and gemologist. The saxon GSM Gemological Microscope 10x-80x is powerful microscope to study small stones and gemstones. This microscope features a zoom lens which allows you to zoom in and out from the object effortlessly with just a twist of a knob. For lighting options, the transmitted and refelected light can be turned on together or on its own, giving you more room to inspect the surface details and structures of the object. Use the gem tweezer to help hold your stone in place while you focus until image is clear. If you want to observe the stone at a different angle, simply rotate the tweezer until the angle comes in view. For serious microscopy work, look no further than the saxon RBT Researcher Biological Microscope. This beast of a microscope features a trinocular head, four objectives of 4X, 10X, 40XR and 100XR, individual eyepiece focusing, double-layered mechanical stage and coaxial coarse/fine controls to make it easy to operate the stage when you're viewing your object through the eyepiece. 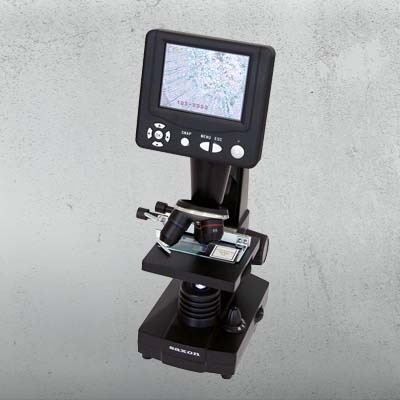 This microscope promises versatility and durability for use at work, school or home. If you need a gemological microscope with extreme magnification, then look no further than the saxon GSM Gemological Microscope 10x-160x. The zoom lens feature allows you to zoom in and out from the object effortlessly with just a twist of a knob. The microscope is also equipped with reflected and transmitted lighting, you can have either or both lights turned on for inspecting surface details and structures.